It has been a good week in the shop and that is always a good thing. 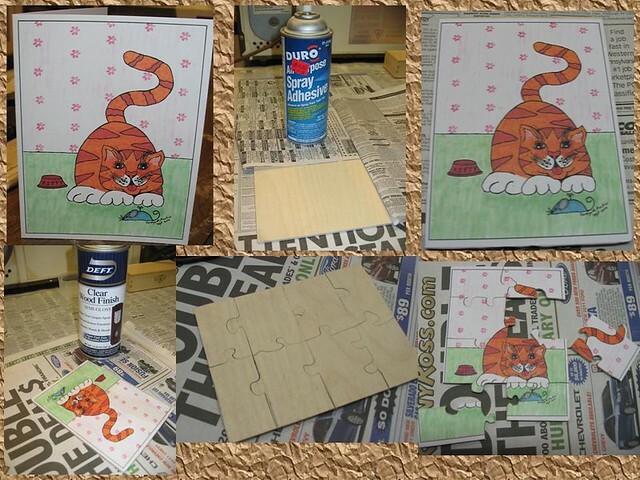 I have been experimenting with puzzles this whole weekend as I have a request to make one. I played around for a day or so and have pretty much the entire puzzle I was asked to make done but need to make a frame. 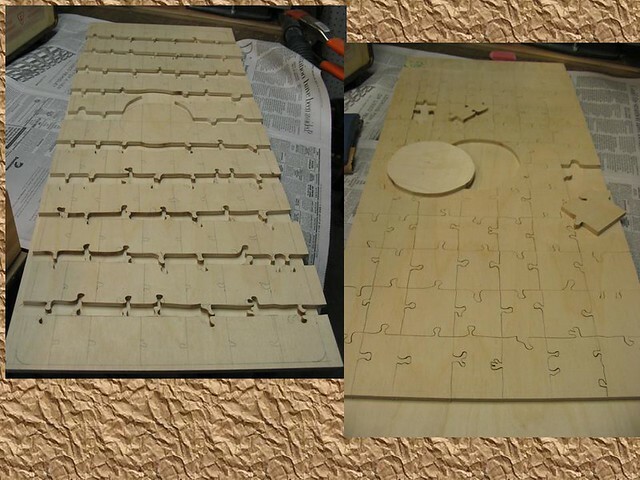 I want to thank Carl at Scrollsawvideo.com for posting his video on making jigsaw puzzles. The process he uses is very easy and my sample piece I decided to make came out great. If you watch his video you will be able to see the process and how each of the pictures from above fit together, I was even able to wrap it up as he suggested and mail it; takes two stamps by the way. Looking forward to hearing from my aunt that she got it as the card was originally made by her. I was able to apply the same premise to a much larger puzzle.. Here is the gridded layout, I added the ball and sockets not so much to actually cut these exact shapes but to aid me in knowing what each piece needed. It worked out quite well. I was able to sand away and erase the lines and such that were left when I got it finished. There is still some work to do on this project but I plan to post the completed one real soon. Earlier in the week I decided to continue on my experiments of milling my own wood for projects, this week mainly for pen blanks. I mentioned in last week’s blog that I purchased a microwave for the shop at a rummage sale for $3, I am very happy to find it works just fine. I came up with a piece of walnut the other week and decided it would give me a good chance to try out microwave drying. In figure 1 you can see the piece that I used. Once again using my joiner I made 2 flat spots in order to run it through the bandsaw. 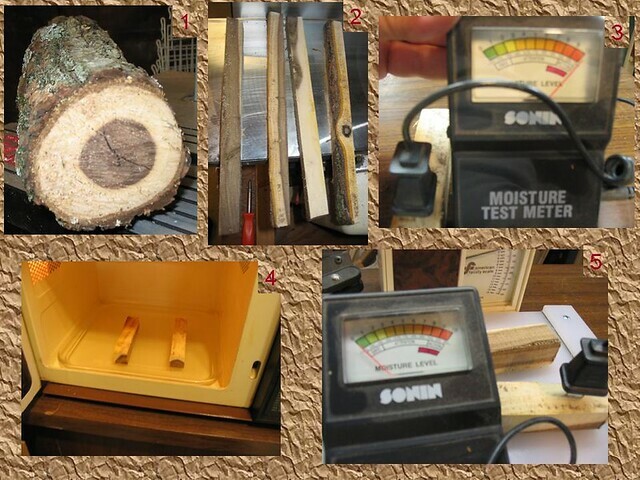 I was then able to slice some slabs into long blanks as you can see in figure 2. These were quite wet as noted on the meter in figure 3. I decided on the short burst method and nuked them 4 or 5 times for 30-45 seconds each. I was able to see the water coming out of them on the microwave tray and when I had them out for several minutes between bursts but saw very little movement on the meter. I decided to let the rest for a day or so. When I went back to them 3 days later and checked with the meter I was quite surprised to see the low reading as noted in figure 5. 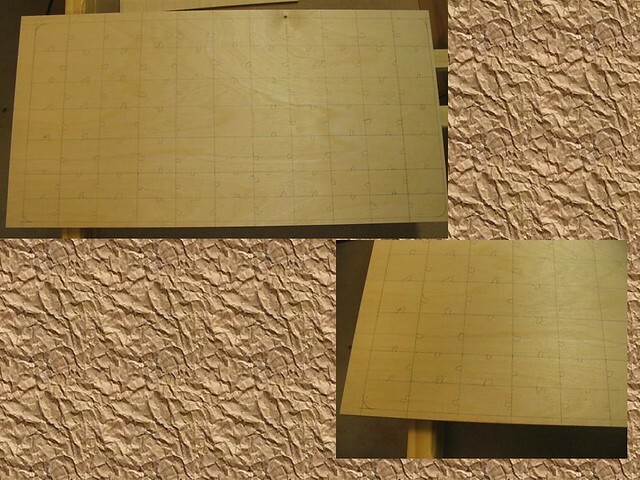 I cut one of the blanks up to set up for turning. I had a small issue with getting the tubes in them, CA can some times dry too quick. But plan to turn at least one piece to see how it works real soon. Should be able to give an update in next week’s blog if not sooner. In the meantime, hope everyone has a good week in their shops. Hey that is a great puzzle choice! Nice job. Like the moisture meeter also…you satisfied with it?